Are you a Doctoral Researcher at Loughborough University or Loughborough University London? 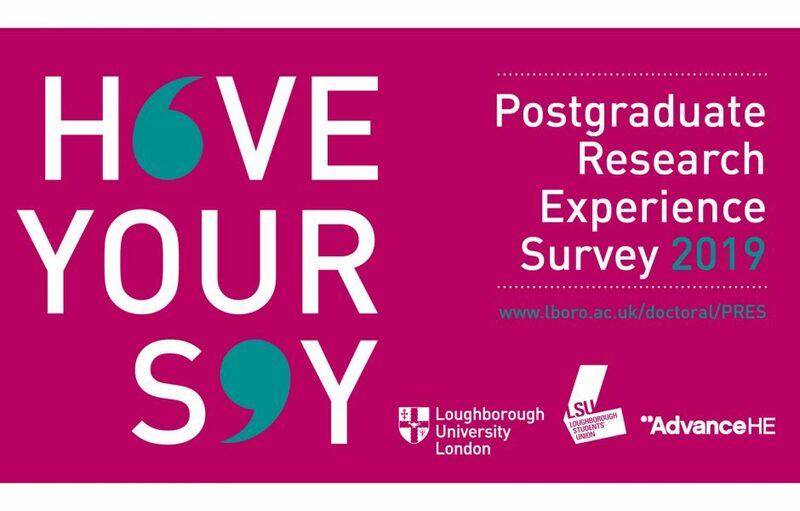 Make sure to complete the Postgraduate Research Experience Survey (PRES) by 17th May 2019! PRES is a national survey conducted by institutions across the UK and globally. The survey allows you to provide feedback about your experience which helps us to keep doing the things that you love and to make improvements to areas that you think could be better. You should have received an email to your university inbox from studentsurveys@lboro.ac.uk sometime during week commencing 11th March 2019. The email provides you with a unique link for you to complete the survey and will take approximately 15 minutes to complete. Your feedback is confidential to the Doctoral College and any reporting of the feedback will be anonymous. The findings from the PRES will be used to improve your programme and the Doctoral Researcher experience for students across the University. It is so important to complete the survey because your feedback helps us to develop an enhanced Postgraduate Research Experience for the remainder of your degree as well as future researchers. Further information can be found on the Doctoral College webpages. If you have any questions, please do not hesitate to contact the Doctoral College at pgresearch@lboro.ac.uk.